A great corporate event can be a huge boost for your company, bringing you the attention you need from the public, investors, clients, and colleagues. But actually planning a corporate event can be a massive undertaking. When planning a corporate event, you’ll have to juggle the dreams of your boss with the realities of event vendors, bridging the gap between what you’d like to see happen versus what’s actually possible. And you’ll be responsible for spending a significant portion of your company’s money, meaning you’ll need the event to be a success. Thankfully, the experts at De Luxe Banquet Hall are here to help with some useful corporate event planning tips and advice. What do you want to get out of your corporate event? This is a question you need to ask as soon as you start planning, as it will guide the rest of your decisions to come. 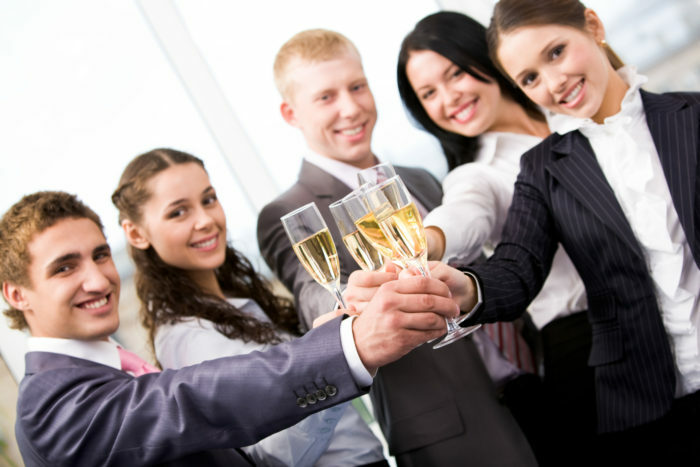 Is your priority to honor employees and help them have fun? Are you trying to get the public interested in your company? Or perhaps you need to get some big investors for future projects? Ask yourself what you ultimately hope to achieve through your corporate event, that way you can set goals for the special occasion and decide what type of event is best for your needs. Before you dive deep into the event planning process, you need to to know how much money to spend on the event. Determining your corporate event budget is tough, as more often than not your boss will want you to save money, but determining your priorities will help you decide where you can spend money and where you should save. With a budget in place, you can begin meeting with event vendors and hunt for an event venue that fits your needs. As we’ve mentioned, corporate event planning is tough, and in order to make it a bit easier you should have a great support team by your side. Gather at least two or three of your most trusted colleagues to help you organize your big event. With a strong team by your side, you won’t get overwhelmed with the planning process, and will have plenty of input on the big decisions bound to come your way. You need people to come to your corporate event, and a good chunk of your budget should go towards corporate event promotion. This could include printing beautiful event invitations, promoting your event in your corporate newsletter, or personally reaching out to important colleagues you hope will attend. You may even want to reach out to the press for promotion if you’re holding a product launch, corporate awards ceremony, or a gala that’s open to the public. You want to get the most out of your corporate event, and in order to build even stronger connections with guests after your big day you should definitely engage in some post-event follow-up. Consider sending thank you notes to your event guests, or personalized messages to the corporate VIPs who were in attendance. That extra bit of work will definitely make a big impact on your guests. Corporate event planning is a huge challenge, but with a thoughtful, organized approach, you’ll be able to plan a great event that makes your company look great. Of course, you’ll also need a location for your special occasion, and if you’re looking for a great corporate event venue in Los Angeles, consider De Luxe Banquet Hall. Our family of event venues feature beautiful decor, delicious catering, and affordable accommodations perfect for any budget and event. For more information on booking and availability, contact De Luxe Banquet Hall today.